To report machine data to your applications you have to be able to acquire it from your devices. 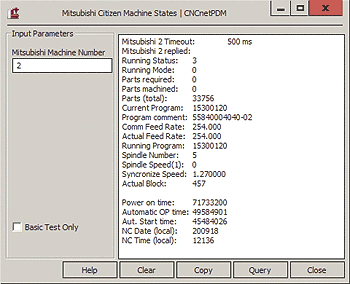 For Citizen machines equipped with Mitsubishi controllers you can use the utility programs MitsubishiGui.exe (GUI) or Mitsubishi.exe (Command line) to do so. The program should also work for Mazak machines that have Mitsubishi controllers. All programs use the most recent version of Mitsubishi’s M700/70 API (Application Program Interface) functions to access the controller and query data. To be able to verify the results it is recommended to use this utility on a laptop with a network connection at the shop-floor in front of the machine. Extract all contents of mitsubishi.zip to a folder on your Laptop. As the program identifies and accesses controllers by using machine numbers the first thing you have to do is to edit the configuration file melcfg.ini. Machine numbers are defined in sections, one for each device. The machine number is the numeric part after Machine, e.g. [Machine01] = 1. Note: The second part of this numeric value uses hexadecimal notation from 1 to F, e.g. 01 = 1 and 0F = 15, remember your math lessons. If you’re testing with one machine it is recommended to leave section [Machine01] as it is. Only in case it doesn’t work you can change the value for Controller from M8NX to NCXJ, NCXK, M6B, NX or M7NX. It is necessary to adjust section [HOSTS] according to your setup e.g. TCP1=192.168.100.1,683 means that the IP Address of your controller is 192.168.100.1 683 after the comma is the port to be used to access the controller, do not change that. For additional machines you have to copy and paste the whole section [Machine01], then change its name e.g. [Machine02] and Device= to a different device in section [HOSTS] e.g. Device=TCP2. In section [HOSTS] you have to add a new device e.g. TCP2=192.168.100.2,683. In field ‘Mitsubishi Machine Number’ enter the number as defined in melcfg.ini. If you don’t get an error, repeat the test with ‘Basic Test Only’ unchecked.